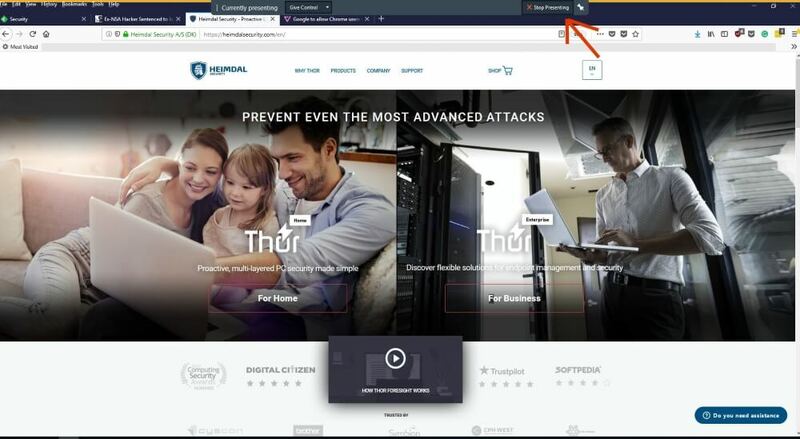 Here at Heimdal Security, we spread our time between providing security tools to prevent serious attacks like ransomware or next-gen malware and providing the education necessary to keep personal data safe across various platforms and devices. Sometimes, it becomes obvious that tools and education alone won’t keep users truly safe online, nor will they enforce their privacy. Sometimes, ubiquitous, extremely popular services release some features that truly boggle the mind. Skype for Business is one. This week, we discovered a serious security risk and privacy breach with the Skype for Business app. It was not related to hacking and other cyber-attacks but a pure “feature”, whose purpose and value we haven’t yet been able to decipher. 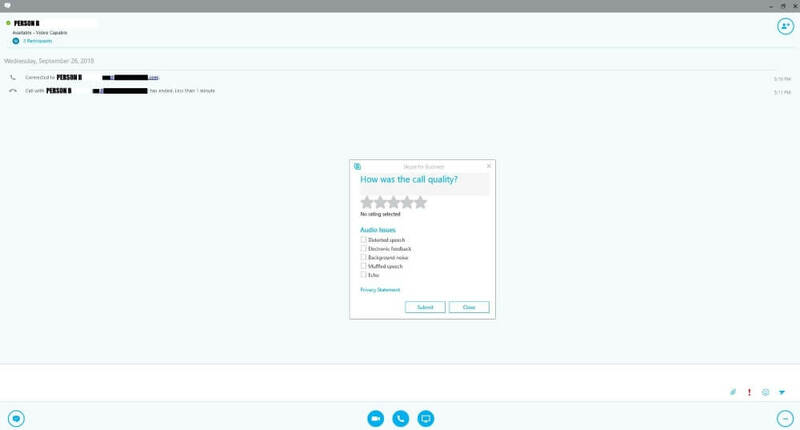 If you do a Skype for Business call with “screen-sharing” turned on, be prepared to share more than what you wanted. Once the person who started screen-sharing hangs up, the desktop-sharing function will continue. The people at the other end of the line will still see what’s happening there. If the person who had hosted the session does not notice the tiny warning at the top, they will continue sharing whatever they’re doing on the screen. Spreadsheets with sensitive financial data, inbox contents, private messages on Facebook, all of them will be seen by the other person. Had a cybercriminal participated in a conversation like this, they would have had a field day with the info obtained. In some areas, a competitor could do seriously damage with how much information they are able to see. We thought that we had stumbled upon a serious security flaw. Imagine our surprise when, after a few seconds of Googling the issue and thinking about contacting Microsoft, we came across this thread. No, screen sharing after ending a call is a “feature, not a bug”. Never mind the fact that a regular Skype user first calls someone to start a meeting, then opens a presentation, then closes the call and assumes that the entire interaction ended. Why would someone possibly want for their screen to still be visible to the other person, even though the dialogue ended? Even if, by chance, that was the case, the tiny ribbon that lets you know screen-sharing has such an unobtrusive design, a regular user will definitely miss it. For such a security-sensitive feature, you’d think neon colors were in order. Certainly, a pleasant design should not be the only priority for Skype for Business. After all, the people using it do have plenty of sensitive information that should not leak. Here is what the caller who initiated screen-sharing can see once he/she hangs up. Here is what’s visible to the ones that just left that call. Spoiler: it’s everything the initial caller is currently doing. And, finally, this is the placement of the ribbon that was designed to let the user know their screen is still being broadcast. It’s almost black, on top of a browser bar of the same color. 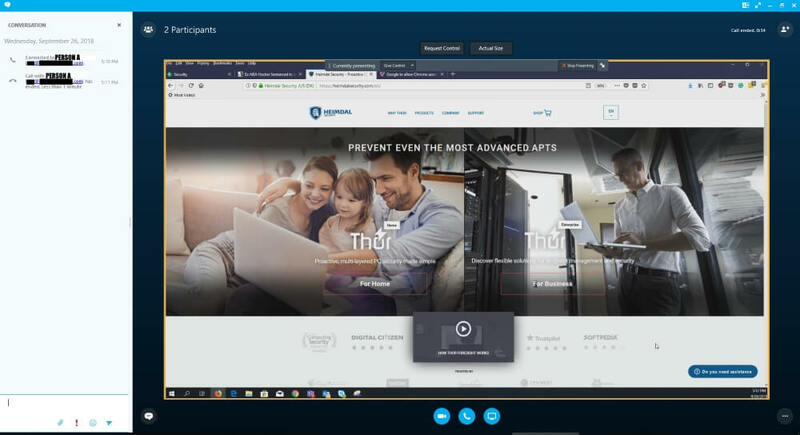 If someone had a secondary display and they were to continue working on the screen with the Skype for Business window, it would have been almost impossible to spot that message. What’s worse is that this is something that’s been signaled plenty of times. Yes, the official suggestion is to close the entire window, not press the button that’s for ending the call. Give it a bit more time, and instead of customer support signaling a bad UI design (user interface) and the developers fixing it, someone will tell you to put a sticker on your webcam if you want to stop broadcasting. This is not to mention what a huge GDPR infringement this Skype for Business bug is. Some experts point out that even sharing usernames in unencrypted communications or on screens can be against the General Data Protection Regulation. Microsoft is not alone in this and could probably pin this one on miscommunication, not bad intentions. What users have to do is to secure their device with the essential security layers and remain updated with current news, so they can act swiftly and protect themselves and their valuable data. Antivirus vendors have your data. Can they handle GDPR? Read again attentively (this time) the Entire article please!